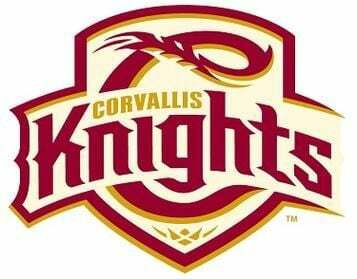 Five members of the Corvallis Knights were named to the South Division team for the 2018 West Coast League All-Star Game, commissioner Rob Neyer announced Tuesday. The 10th annual midsummer classic is scheduled for 6:35 p.m. on Tuesday, July 17, at Civic Field in Port Angeles, Wash. The Port Angeles Lefties are the host team. The all-star Knights are second baseman Chad Stevens (Portland); center fielder Chandler Anderson (Utah); catcher Cole Hamilton (Linn-Benton CC), and right-handed pitchers Landen Bourassa and Daniel Slominski of the University of San Francisco. Knights’ head coach Brooke Knight and assistants Ed Knaggs, Kellen Camus and Youngjin Yoon will coach the South team, comprised of players from Corvallis, Bend, Walla Walla, Cowlitz and Portland. The North Division team features players from Yakima Valley, Bellingham, Wenatchee, Victoria, Port Angeles and Kelowna. A second-year Knight, Stevens is ninth in the WCL with a .324 (35-108) average heading into Tuesday night’s game at Yakima Valley. He has two homers, 19 RBIs and seven stolen bases. Anderson is 10th in the WCL batting race with a .316 average. He has eight doubles, three homers, 12 RBIs and nine steals. His 11 extra-base hits lead the Knights. Hamilton is hitting .353 (12-34) with three RBIs, but does not have enough plate appearances to qualify for the batting title. Hamilton was selected by Washington in the 23rd round of the MLB draft last month but did not sign. Bourassa is 4-1, 2.55 in five starts and is tied for the most wins in the WCL with several other players. He has 24 strikeouts in 31.2 innings and has not allowed more than two runs in four of his five starts. Slominski is 0-1, 3.27 in four starts, with 13 strikeouts in 22 innings. He has pitched five or more innings in three of his four starts. The Saltwater Splashdown Home Run Derby, held in conjunction with the All-Star Game, is scheduled for 6:35 p.m. July 16 at the Hollywood Beach Pier in downtown Port Angeles. Each team’s participant will be announced later this week.